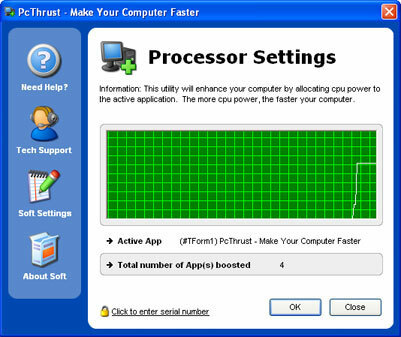 PcThrust is a tool for all that allows you to modify your computers settings to increase performance and speed. No modifications to your hardware are made and all adjustments and settings are done in an easy to use interface that a child could use. Most other cpu/computer enhancers promise that they work while you notice no difference at all in performance. With PCThrust your computer will run faster than ever before. ...... Automatically de-allocates CPU priority when a new active application is selected. * Works in the background to optimize applications constantly, raises priority levels to reasonable values to maintain system stability. * Visual representation in system tray which displays priority optimization for currently active application. * Built-in block list of applications which are not compatible, to prevent problems with the software such as slow downs or computer crashes. * Easy and intuitive user interface which performs CPU tuning in real-time. Qweas is providing links to PcThrust 2.10.8.2012 as a courtesy, and makes no representations regarding PcThrust or any other applications or any information related thereto. Any questions, complaints or claims regarding this application PcThrust 2.10.8.2012 must be directed to the appropriate software vendor. You may click the publisher link of PcThrust on the top of this page to get more details about the vendor.